The theme among the HepsNation women tonight is “qualifying for their first NCAA Outdoor Championships final”. The weather – 59 degrees and raining – did not make it easy, but seven athletes have qualified for their first ever NCAA final while one grabbed First-Team All-American honors. 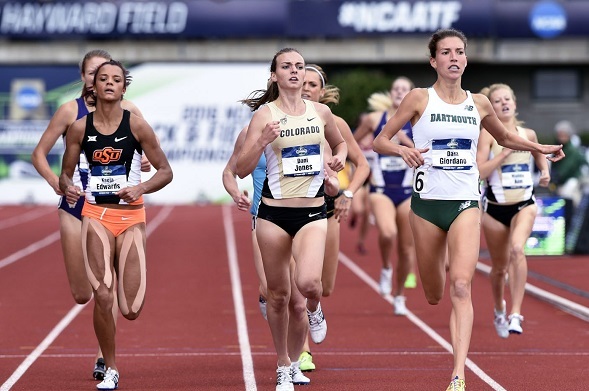 Some of these athletes will have this final be the final race of their collegiate career. Harvard junior Nikki Okwelogu earned her first Outdoor All-American honors in the shot put, finishing eighth overall with 55-05 ¾ for First-Team honors. The distance came on her first throw of the competition, which initially put her seventh after the first three throws. She’s previously won two Indoor First-Team honors in this event but she will have the chance to get another All-American honor on Saturday in the discus throw. Hopefully that throwing circle will be dryer for her than it was today. Dartmouth senior Dana Giordano was in the first heat of the 1,500m semifinal, and from the start, she decided to set the pace. She quickly went to the front and led the pack. At one point, she had a 5 meter gap on the next closest competitor, but the field closed in as she approached the bell lap. Giordano may not have had the best wheels in the heat, but she held off the pack, charging hard to hold on for the heat win. She was rewarded not only with an automatic berth to Saturday’s final, but also a 5 second personal best – 4:13.18, the fourth fastest time in conference history. She ended up being the fastest qualifier for the 1,500m final. Harvard senior Paige Kouba will be seeing her first NCAA track final as she was one of the automatic qualifiers in the steeplechase. The Eugene, Ore. Native started off in the middle of the pack for the first half of the race but moved herself into an automatic berth when she was among the pack of five that broke away with about 2 laps to go. She finished in a comfortable third in her heat with 9:57.59 – two second back of second place but a second ahead of fourth place (the top 5 in each heat advanced). Princeton senior Cecilia Barowski’s 800m semifinal heat was similar to her semifinal heat that she ran at the NCAA Indoor Championships. Barowski was in the middle of a tight pack come the halfway point but she made her move after the bell to move up on the field to take the lead with 100m to go. On the final straight, Barowski held off the field to take the heat win in 2:03.50, just in front of the defending champion Raevyn Rogers of Oregon (2:03.55) and Stanford’s Olivia Baker (2:03.56). Barowski’s time was the third fastest of the evening. This will be Barowski’s first NCAA outdoor 800m final. Harvard senior Autumne Franklin came close to making the 400m hurdle final last year, but missed out as she was the first woman out. Considering how this was her last chance to make the final, she made the most of the opportunity. She won the first 400m hurdle semifinal heat with a time of 56.09, besting the next closest finisher by over 0.2 seconds. Teammate Jade Miller was in the second semifinal heat, where she finished fourth in 56.92. The top 2 in each heat and the next two overall fastest make the finals, but due to the times from the first heat, Miller will miss out on the final this year as one of the fastest non-qualifiers in NCAA Championships history. Last year, she had finished fifth in this event. In the end, Franklin ended up as the fifth fastest qualifier while Miller was the eleventh fastest in the field, earning Second-Team honors. Meanwhile, Harvard freshman Gabrielle Thomas showed the nation that she is a force to reckon with in the 200m. She won her semifinal heat in 22.83 by edging out USC’s Deanna Hill (22.85) using a late charge in the final half of the race. Both women will advance to Saturday’s final. Thomas’ time was the fifth fastest qualifier in the field and she will be one of three freshmen in that final. Harvard’s 4×100 relay team with freshman Ngozi Musa, Thomas, Franklin, and Miller finished seventh in their semifinal heat with a time of 45.03, the 19th fastest time in the field. The quartet didn’t have the smoothest handoffs, but their time would still be a conference record if they had not already ran sub-45 seconds earlier this season (44.29 is the current record). The team would have needed to run sub-44 seconds to be in consideration of making the final with national sprint powerhouses like LSU, Texas A&M, and Oregon. But there will be a HepsNation representative in the 4×100 final – Danielle Barbian (Harvard ’15) ran the lead-off leg for Oregon in the first semifinal heat, putting the Ducks in great position to ultimately finish second in their heat in a speedy 43.01 behind Texas A&M’s 42.92. Another HepsNation alum who will be competing in a Saturday final is Princeton alumna Jasmine Blocker. Now running for Tulane, Blocker grabbed an automatic berth in her 400m semifinal heat by finishing in second place in 52.89 after having a strong final 100m. Technically, it was the slowest qualifying time for the 400m final, but Blocker is a finalist and guaranteed a First-Team All-American honor if she finishes the race. Cornell’s Caroline Kellner had a good start in the 10km final, where you could see the Big Red athlete among the top 6 runners, running along the outside edge of lane 1. But the field picked up the pace after 5 laps and Kellner started to get gulped up by the remaining field, dropping back in position. She ultimately finished 24th in the event with a time of 34:45.54. 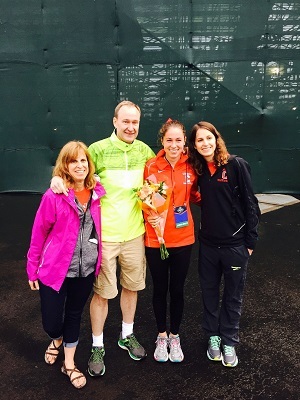 Afterwards, her family – including older sister Katie, who is a multiple Heps champion and former All-American in this event – were on hand to give her flowers to wrap up the Kellner family collegiate career. At the NCAA Preliminary Round, Harvard made Ivy League history by breaking 3:30 for the first time ever in the 4×400 relay. The quartet would need to replicate that performance in order to make the cut for the final as only the top 2 in a heat were given an automatic berth, while the next two fastest team times would fill out the field. The Crimson flirted with an automatic berth as Thomas and Franklin had the team in second place one step behind Texas after the second exchange. Christi Scott and Miller did their best to hold onto their position but unfortunately, the team faded and ultimately finished seventh in their heat and 21st overall in a time of 3:36.46. Friday will be the conclusion of the men’s competition, where Yale’s James Randon, Penn’s Thomas Awad and Sam Mattis, and Cornell’s Bobby Plummer will have their opportunities to contend for a national title. This entry was posted on Friday, June 10th, 2016 at 1:40 am. It is filed under Athletes, Spotlight. You can follow any responses to this entry through the RSS 2.0 feed.